The oldest historical models I have in my collection date from 1983 (or thereabouts) and are some 15mm Minifigs French Napoleonics that I bought when I returned to the hobby at the end of my student days, I sold off all the 25mm Minifigs British that I had collected in my teens and used some of the money to start up in the smaller scale. These troops have seen much action over the years, using all sorts of rules, notably Napoleon’s Battles, which I played quite a lot just after they came out in the late 1980s. I grew bored of that game after a while, I seem to remember it all became a bit formulaic and predictable after a while, with the winner inevitably being the side able to assemble the largest number of combined arms attacks. But before deciding this I expanded the collection quite a bit, and bought a whole load of Russians to fight the French. 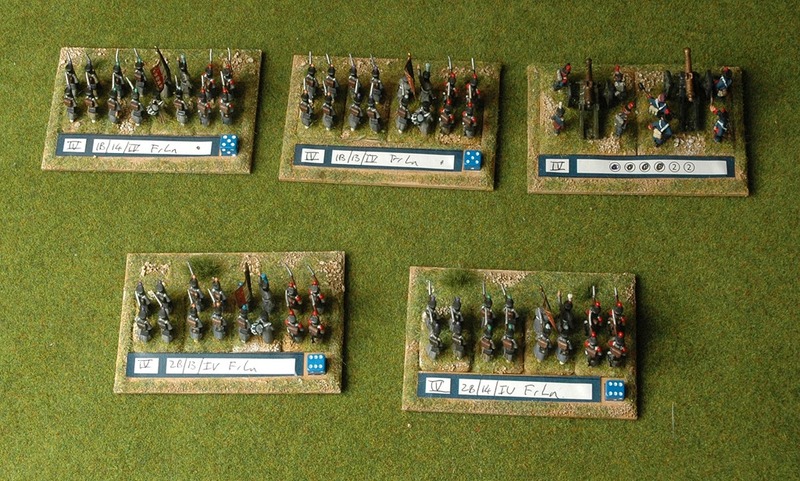 In the mid 2000s I rebased the cavalry on 1” squares so could use them with Age of Eagles, the Napoleonic game based on Fire and Fury, but I only ever played one game. I quite liked the rules, but my regular opponent hated them. 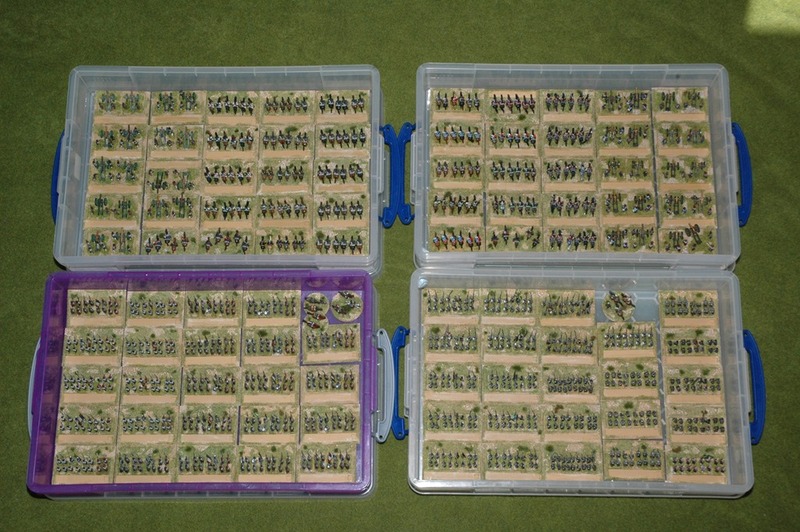 In the ten years since then my collection has mostly been sitting idle, except for a few outings in 2011 when said regular opponent put together an Impetus Napoleonic version, for which I made sabots, which I also intended to use to play Grande Armee, which I also play with my 6mm Napoleonics. So Sam Mustapha brings out his Blucher rules and my mates at the South East Scotland wargames club decide to give it a go. But their troops are based 30mm x 40mm and wouldn’t fit on sabots the size I was using. So it’s back to the drawing board with us deciding to standardise on 80mm x 60mm sabot bases for Blucher. That’s some of the ones I’ve made above, they’ve got the advantage over the earlier ones in that they use fewer troops so I get more bases. There’s space on the back for a label, and a slot to hold a 7mm dice which we use to designate the Corps the unit belongs (different Corps have different colours) to and to keep track of its elan, Blucher’s measure of combat effectiveness that diminishes as a unit gets shot at or fights in close combat. The sabots are made from laser cut mdf rectangular bases and custom cut pieces with holes for a 7mm dice (both made for me by Leon at Minibits) and 2mm pine strips with which I make the box to hold the troops. I thought about getting bases with cut laser spaces for the troops, but this wouldn’t work with my stuff as all my bases seem to be slightly different sizes as they were made by different people at different times, from different materials. A few weeks of hobby time and I’ve got a hundred of the things made. That should be enough given that it’s recommended you use 25 bases for a three hour game. .
Nice work on those sabots. I like that it has the label and die holder. Properly used, sabots like this reduce the need to rebase, and improve the overall look of the game. In your first sentence you really mean ‘1983’ don’t you? I did indeed Jim. Even you weren’t wargaming in 1883 :-). Now edited, thanks. My 15mm army is based for Napoleon’s Battles (a system I still get a lot of enjoyment out of – you are right about combined arms attacks, but they still require some skill to pull off and with skill can be reduced in impact) and I have recently picked up the Blucher rules as I am looking for a Nopleonic system that is easy to play on a club night and also intrigued about the campaign system. I went with 3×2 inch bases and was piling on 8 of my Napoleon’s Battles infantry bases. You technique looks better. I tried aout a few combinations before deciding on that one. 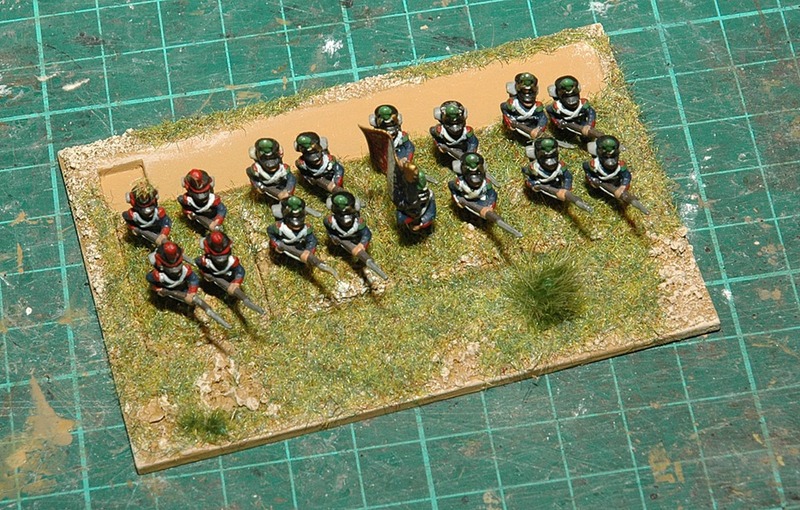 Clincher was that some of my clubmates have their Napoleonics based 40mm x 30mm. 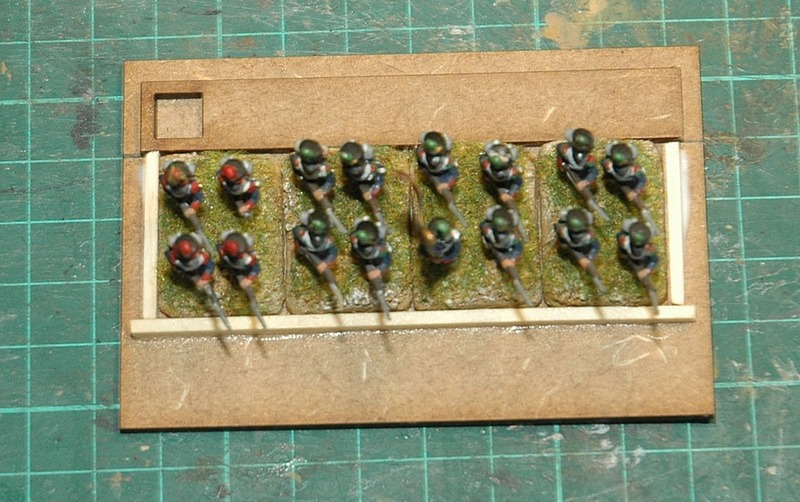 With 90mm x 60mm sabots we can all get bases that are the same size and which look much the same. And you get twice as many sabots if you don’t pile the models on. Mind you I’ve found that you don’t even need 25 bases a side to get an evening’s entertainment. I’ll only be needing the 100 I’ve made for all day games. I’m impressed, 100 bases, it doesn’t seem much until you realise there’s 16 figures to 1 base. Going back 45+ years ago when I finally settled on napoleonic games, 20mm Hinton Hunt and Miniature Figurines, moaning about how long it took to paint a battalion of 20 figures..
Then having to mix 25mm figures on the table because that’s what everyone else was buying. The thought of painting 25 bases (400 figures) would put me off for life.. They were all sitting in a box, I painted them last century. Good to get them in use again. Inspiring post- just found a variant for ACW and needed just such advice!